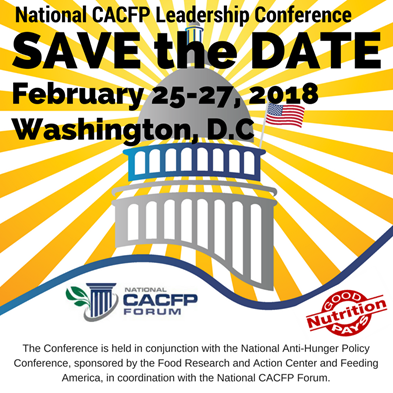 The National Anti-Hunger Policy Conference, in cooperation with the National CACFP Forum, draws anti-hunger and anti-poverty advocates; federal, state and local government officials; child advocates; representatives of food banks and food rescue organizations; and nutrition and anti-obesity groups. Members of Congress, Hill staff, and key Administration officials attend the conference, provide comments as part of plenary sessions and panels, and join participants at receptions and special events. The three-day event is packed with numerous networking opportunities, interactive training, content-rich sessions, and a day on Capitol Hill to meet with Members of Congress and their key staffers. Participants share information and learn how to strengthen the quality and reach of federal nutrition programs, learn best outreach and program practices from other states and localities, fill in the gaps in food service for millions of low-income children, and identify creative ideas for new and innovative approaches to ending hunger. The National CACFP Leadership track, Transition. Transformation. Triumphant! Moving Forward Together, brings together the CACFP community to discover best practices, shape change, meet with USDA officials, and learn strategies for successfully implementing the new healthier CACFP meal pattern, identify opportunities for cutting red tape, and building a thriving CACFP program. Take advantage of this amazing opportunity to connect and network with more than 800 public health officials who share an interest in maternal and child health. Conference session topics will include technology, cultural competence and family-centered care, and health care financing and coverage. Early care and education programs who receive food program assistance (CACFP) should be in compliance with new guidelines which went into effect October 2017. Make sure your menus and procurement reflect the changes.